Tags: "Annie's Blue Ribbon General Store", "NYC Loves ABC Poster"
More NYC love- this time from our clever friends at Mr. Boddington! From A (alternate side of the street parking) to Z (zillionaire jogging) you will delight in every letter with this fabulous new poster! 11″ x 17″ (easy to frame!). 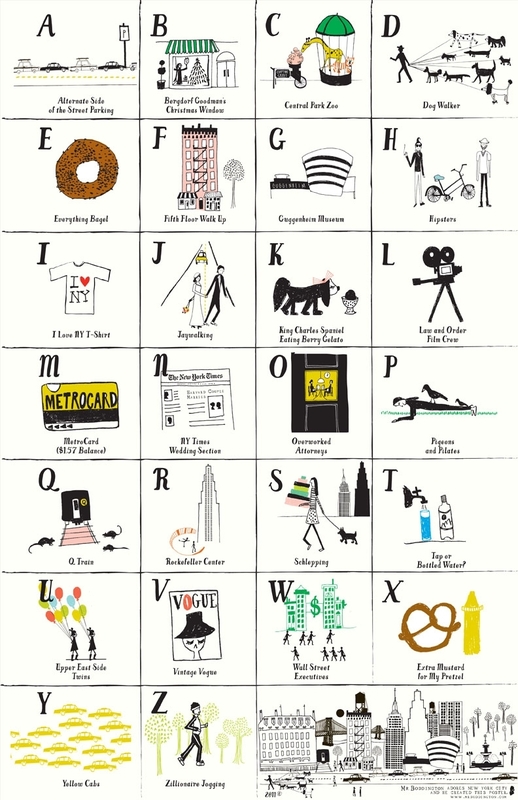 NYC Loves ABC Poster– $35. 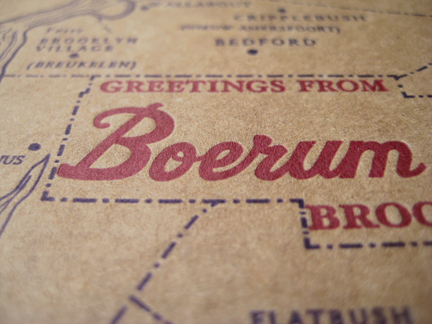 More Brooklyn Love, Letterpress style! Tags: "Annie's Blue Ribbon General Store", "Boerum Hill Letterpress Postcard", "Brooklyn Letterpress Postcard", "Brooklyn Postcard"
Loving these new Letterpress Kraft postcards we just got in, designed and printed by a local artist. They are a fun mix of new and old. Brooklyn and Boerum Hill (our ‘hood) postcards available- $3.50 each. Send one! Frame one! Keep one! I am in love with… this Brooklyn Poster! 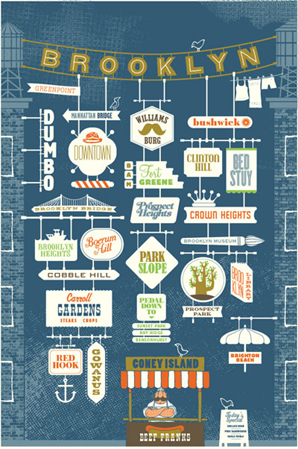 Tags: "Annie's Blue Ribbon General Store", "Brooklyn Poster by Jim Datz"
I can’t wait to hang this great Brooklyn Poster at the shop AND at in my apartment! 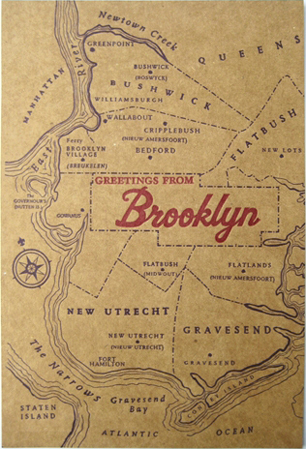 It combines several of our loves- “Brooklyn, typography, color, 50’s inspired illustrations, and urban signage.” Hand screened and signed by the artist (on thick 100% Recycled acid-free 100# soft white paper stock)- 16″ x 24.” Brooklyn Poster by Jim Datz– $60. A new Brooklyn ABC (and 123) book! Tags: "Annie's Blue Ribbon General Store", "The ABC's of Brooklyn"
A fun new Brooklyn book for the kiddies from a local author/photographer just found its’ way into our shop– The ABCs of Brooklyn (also includes numbers too- very cleverly done). As our beloved Borough President Marty Markowitz said about the book, “Just like our eclectic borough, this book has something for everyone. It captures the charm, history, diversity and fun of Brooklyn. It’s all here in this appealing book, and I know you will love visiting the world’s biggest neighborhood- Brooklyn, USA!” Check it out! 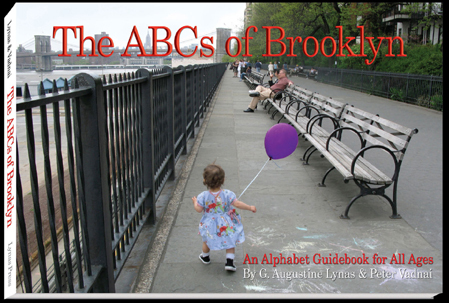 The ABCs of Brooklyn, An Alphabet Guidebook for All Ages– $16.95. Memorial Day Weekend is almost here– it’s BBQ time! 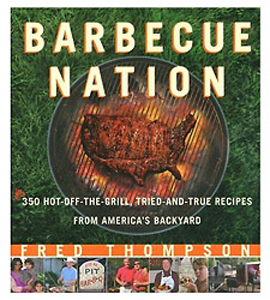 Tags: "Annie's Blue Ribbon General Store", "Barbecue Nation", "BBQ Sword Fork", "Fire Bucket BBQ"
Just in time for Memorial Day Weekend we are stepping up our Grilling Game– first up with this awesome cookbook/travelogue of BBQ recipes from around the country, Barbecue Nation. And BACK BY POPULAR DEMAND– our BBQ Sword Fork, complete with mask (to keep your secret identity for when you burn the sausages!). Plus the Fire Bucket BBQ— GOOD TIMES. Get cooking!! Barbecue Nation– $18.95, BBQ Sword Fork– $29.50 and Fire Bucket BBQ– $80. Ready Set Glow! Firefly Kits…. Tags: "Annie's Blue Ribbon General Store", "Firefly Kits"
A-D-O-R-A-B-L-E!!! These Firefly Kits are soo cute I want one for ME, but alas they are in kid sizes only (2-4-6). 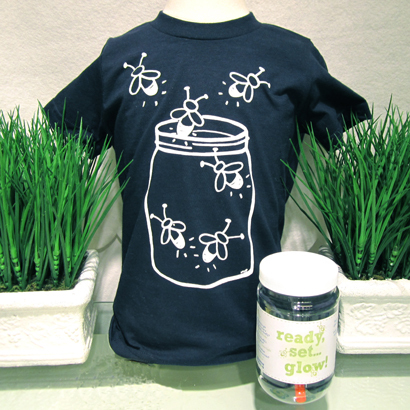 Packed inside the unbreakable jars (designed to easily catch and release Firefly’s) are a hand screened/hand drawn unisex American Apparel T-shirt, magnifying glass, aluminum foil and informative guide with tips for finding insects to light up their jar and jokes to light up their faces. It’s (finally) heating up, summer is coming! Firefly Kits in Size 2, Size 4 and Size 6– $30. Tags: "Annie's Blue Ribbon General Store", "Bombs Away Shot Glasses", "Now Panic and Freak Out Cocktail Napkins", "Rapture Party Ideas"
One of our dear friends and customers, Justine, came by earlier today looking for a clever gift for a Rapture Party tonight. You know, in honor of the world coming to an end?! Of course, I went straight to the bar section. 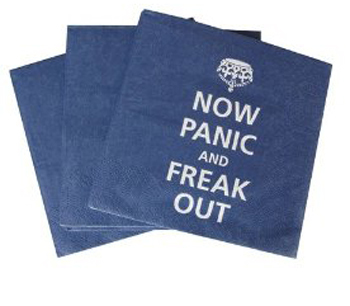 We thought these Now Panic and Freak Out Cocktail Napkins were perfect, especially when she paired it with the Bomb’s Away Shot Glasses. Good times! 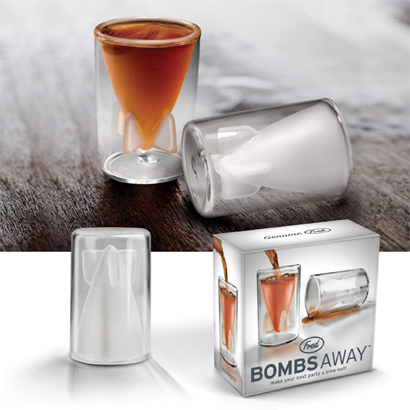 Now Panic and Freak Out Cocktail Napkins– $5.50 for a pack of 20, Bomb’s Away Shot Glasses– $22.50.